Snow falling in front of our lens reduces the visibility of our scene. This varies a lot based on the amount and the density of snowfall. A fine dusting fills the air with a light haze, creating a subtle yet visible separation between nearby and distant objects. Moderate snowfall brings the veiling closer to us and typically isolates nearby subjects from any background distractions. Of course, a blizzard pretty much obstructs everything, especially at night. Trying to get shots while standing in an arctic like storm in the dark is a lot worse than a bad idea. On the other hand, photographing in a heavy nocturnal snowstorm is a magnificent experience, albeit challenging, and can produce very dramatic and expressive images. But there is one technical drawback we must be aware of. Light metering a nighttime shot will not account for the effects of falling snow. Fast and furiously falling flakes frequently filter the fortune we find in our frame. And the effect goes beyond the haziness we see with our naked eye. Over time our subject is veiled by a curtain of snow, which masks the light seen by our camera. During an expanded moment this can cause an exposure decrease of one to two f-stops. The result is like selective exposure imposed by nature that we have no control over. The solution is to extend our bracketing session by adding one or more longer exposures. For example, if we think the longest exposure should be 30 seconds, it is a good idea to include exposures of 1 and 2 minutes when photographing in a snowstorm. Otherwise, even the longest shot may turn out to be under exposed. Merry Christmas and Happy Holidays. Over the years, I’ve spent Christmas in Yosemite more than a dozen times. On Christmas Eve of my last holiday in the park, it began snowing heavily around noon, and continued throughout the night into Christmas morning. We went to the Chapel for the Christmas Eve service at dusk. After the service, the storm was at its peak, and the snow on the ground was knee-deep. We tromped back to our cabin, then I returned with my camera, tripod and umbrella. I bracketed up to 2 minutes thinking that was long enough. 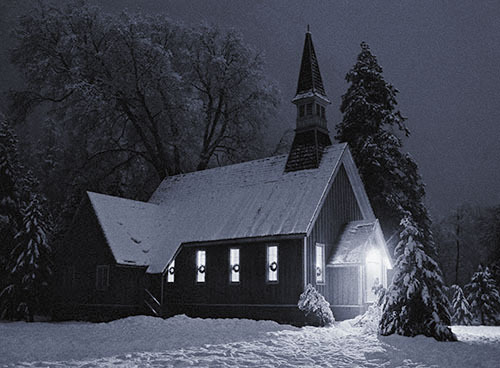 The next night, on Christmas, I photographed the Chapel again when it was not snowing, using the same exposures. Turned out a 2 minute exposure was great when it wasn’t snowing, but under exposed by about one f-stop during the snowstorm. After studying my B&W negatives, I realized that the heavy snowfall was actually blocking the exposure. This final image is the result of a 2 minute exposure shot at f8 with TMAX 3200 film. I have always wished I had taken the time to get a 4 minute shot to capture more in the shadows. In the darkroom, Gold toning produces hues ranging from light to deep blue. Intermediate gold toning produces a noticeable bluish tone. The toning effect was applied to this image to emphasize the look of the snow covered scene at night. This B&W image was toned in Adobe Photoshop with an ICC Profile derived from the “GalleryGoldTonerBlue” Color Map created in Mac App SuiteProfiler. Instead of waiting for a huge winter storm front to move in, it is best to practice dealing with the technical challenges of photographing in a snowstorm ahead of time. Set up your camera and tripod in a dark environment, indoor or out, with the foul weather gear you use to protect your equipment. Rehearse managing your exposures while also keeping your camera and lens dry. Now you are prepared to tackle the challenge of shooting a saturated snow scene safely. Say that 5 times really fast. Be sure to review the Safety & Precautions page. Leave comments on this post to share your ideas and experience, or ask questions. Don’t miss my future posts! Subscribe to The Art of Night Photography by Email. Support The Art of Night Photography. Little is more beautiful than snowfall in the wintertime, especially on a cold winter night. Snow falling from the heavens can transform an ordinary place into a world full of mystery and magic. In low light, snow looks like stardust falling softly from the sky. Snowflakes, floating gently to the ground, add a sense of calm and quiet to a scene … the silence is deafening. With long exposures, falling snow becomes invisible to our camera’s eye, but light caught by snow crystals creates a subtle glow that fills the air. But keep in mind that photographing snowfall after nightfall can have some minor pitfalls. It is normal to seek shelter in the snow when shooting at night to protect yourself and your camera. But finding a safe place from which to shot can be a double-edged sword. Be forewarned. Be careful where you take cover. Snow does not drop only from the sky. Snowpack or icicles can also fall unexpectedly from tree limbs, rooftops and electrical wires, or from anything overhead where snow collects. Having a pile of snow come crashing down on you is not necessarily dangerous, but it can be quite a shock, and certainly an unwelcome interruption to a desirable photo session. Other than the exercise in caution to protect yourself and your camera, photographing at night while it is snowing is an exhilarating experience. By taking just a little more risk than usual, photographing a nocturnal winter wonderland can reap tremendous rewards, namely more evocative images for your nighttime portfolio. One moonless night, a relatively heavy snowstorm came to town, so of course I grabbed my camera and headed out to explore the possibilities. When I set up my tripod and camera for this shot I didn’t notice that I was standing under several electrical lines covered with snow. In the middle of a 4 minute exposure, I was surprised by a giant pile of powder crashing down on me and my camera. “Not to worry,” I thought, “I’ll just dust the snow off my camera and clean the lens.” Then to make sure my lens was free of snow dust, I blew on it. Bad idea. I didn’t just fog my lens, the moisture from my breath froze and created an ice sheet on the glass. So I looked around and found a place to get out of the falling snow. I then put my camera under my coat for a few minutes to warm it up and melt the ice. Then I had to dry off the lens with my shirtsleeve, because everything else was wet from the snowy assault. Finally, I returned my camera to my tripod, and finished my photo session. Lesson learned. This image is the result of bracketing then selecting the 2 minute exposure shot at f8 with TMAX 3200 film. The long exposure was necessary to capture the snow in the foreground. Silver toning is the perfect choice for this black and white image to convey the look and feel of the snow filled nighttime scene. This B&W image was toned in Adobe Photoshop with an ICC Profile derived from the “GallerySilver” Color Map created in Mac App SuiteProfiler. Next time you look out the window and see snow falling at night, go out and photograph a scene covered in snow. A lens hood and a cloth draped over your camera should protect your equipment, but take an umbrella along just in case. In one half of the world, winter is once again upon us. Some would swear that it has already arrived, and a good time to stay indoors warming ourselves by a fire. But it is also a great opportunity to not only go out and experience the cold winter weather, but also a chance to capture our experience of the cold, crisp light we see after the sun goes down. Cold winter nights seem quieter and more peaceful. We are more likely to find ourselves alone than during the warmer seasons. It is a time to roam freely and seek out the more still and thought-provoking scenes in our hunt for the great diversity of light. Freezing temperatures at night create an interesting mix of sensations to portray in our images. The air feels soft, but light looks stark. The weather feels chilly to the skin, but can be heart warming. Trees are alive, but bare, taking on a more dramatic form. Everything seems more acute to the eye, and to the camera, in the frigid night air. Winter nights show us a different way to see the world, and a different way to capture our experience of the world through image making. It gives us a chance to create images that convey a sense of quiet impact, a personal interpretation of the night. For over 24 years I spent a lot of time in Yosemite, especially in the winter time. It is the season of less people and more spectacular weather conditions. When I started doing night photography, I spent many cold winter nights capturing the park’s wonders in a different light than the norm. I came across this scene one winter night after I drove into the park and was walking to the lobby of Yosemite Lodge to check in for the weekend. The back lighting, combined with the slightly smoke filled air catching the light from the front of the cabin, was very dramatic. This particular cabin, similar to the one I usually stayed in, was washed out in a flood in the late 1990’s. It was never rebuilt. Much like the pioneer cabin taken at Wawona in Yosemite, this cabin has the look and feel of someone at home, all warm and cozy within, as the nighttime freezes without. The lack of shadow detail in the cabin beckons us to solve the mystery of what lies inside. This image is the result of bracketing then selecting the 15 second exposure shot at f8 with TMAX 3200 film. In the darkroom Selenium toning creates a cool purplish hue in the darker tones and strengthens the tonal separation in the subtle highlights. 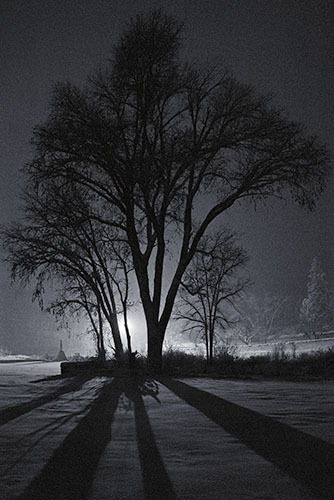 The toning was selected for this black and white image to enhance the look of the brisk winter night. This B&W image was toned in Adobe Photoshop with an ICC Profile derived from the “GallerySelenium” Color Map created in Mac App SuiteProfiler. We all know how a cold winter night feels. Next time you photograph at night during the coldest season of the year, take the time to compose an image that captures both the look and the feel of your experience of the cold winter night. I'm a photographer, photography instructor/teacher and a software engineer. The purpose of this Blog is to share my images, ideas and experience in Night Photography. All site content Copyright © 2014 Dana Foy (except where noted), all rights reserved.